Being a football hipster is serious business with knowledge about the young starlet making waves for a non-mainstream mid table side often a prerequisite rather than a feather in the cap. To further enhance your, perhaps, burgeoning reputation as a true hipster, Outside of the Boot is on hand to provide an in-depth guide to some of the less celebrated teams around Europe. In this edition of the series, Andrew Thompson has a look at Schalke 04. Based in the city of Gelsenkirchen, the foremost mining city in Europe situated in the industrial heart of Germany, Schalke 04 has long been one of the most well supported clubs in the country. Die Konigsblauen can certainly be proud of the foundations laid back in the 1930’s and 1940’s, when the club won the league on six occasions. Despite going on to win the league again in 1958, that would be the last time Die Knappen would lift the league trophy, and despite finishing runner-up or in third place on quite a few occasions since, the general consensus is that they are very much a “nearly” club. Blessed with one of the most highly-touted youth setups in Europe, the framework for success is certainly there, but the ability to push forward in the recent past has not been shown, only finishing in the top-three twice in the last six league campaigns. This past season, littered with inconsistency, that saw them finish a disappointing fifth, and if not for Hertha Berlin’s monumental collapse and Mainz’s patchy form in the final weeks, Schalke could have very easily finished out of the European places all together. It was with this knowledge that manager Andre Breitenreiter, after only spending a year on the touchline at the Veltins-Arena, was replaced with up and coming Augsburg headmaster Markus Weinzierl. 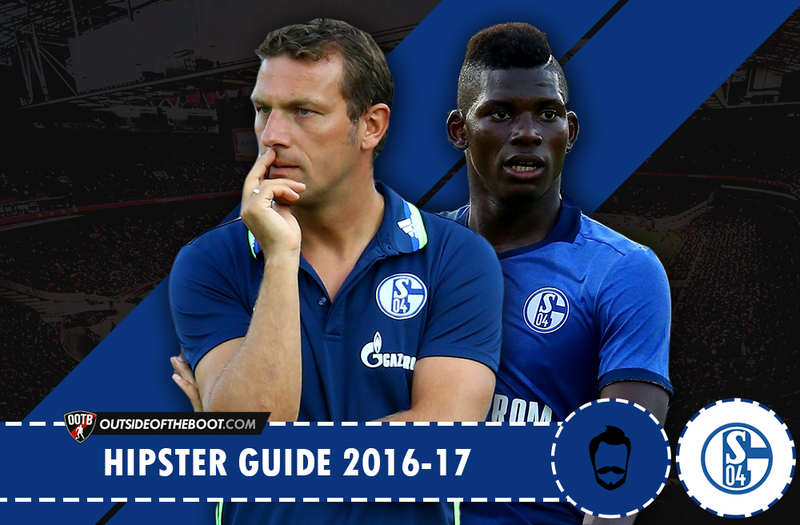 I have profiled Weinzierl before for Outside of the Boot, taking an analytical look at his first season in Bavaria with upstarts Augsburg. In his first season in charge of Fuggerstadter, the Swabian-side finished an incredible fifth, and despite a real lack of quality compared to so many other clubs in Germany, his well-drilled troops with a defense first approach shocked the league and found their way into the Europa League. The 2015/2016 season would see the club go through a huge regression, only managing to grab twelfth-place, much of which can be attributed to their incredibly poor start to the campaign that saw them earn the full three points just once in their first twelve league outings. However, much can be owed to their ability to rebound from such a woeful start, considering many would have put their money on the club failing to avoid the drop. Perhaps Weinzierl’s ability to rally his troops from a mental standpoint should be lauded more than it was, and using their success in their first jaunt into Europe as a spring board (they would end up being ousted from the competition by Jurgen Klopp’s Liverpool in the knockout stages), his man-management capabilities to motivate those under his command surely must be given due credit. And it is these qualities, added to his tactical consistency and approach to the game that made Schalke stand up and take notice. Under the Breitenreiter stewardship, Schalke has two main tactical systems in which they deployed; a 4-2-3-1 and a 4-4-2. Even though they had players capable of controlling a match, Schalke’s best performances came from utilizing the counter-attack, especially through wunderkind Leroy Sane down the right flank. Regardless of Breitenreiter’s willingness to deploy in two main set-ups throughout the season, and even experiment with other formations as well, Schalke were not flexible from a tactical standpoint and also struggled at the back in multiple ways that would see them exposed to the tune of 49-goals allows in 34 league matches…certainly an unacceptable tally. 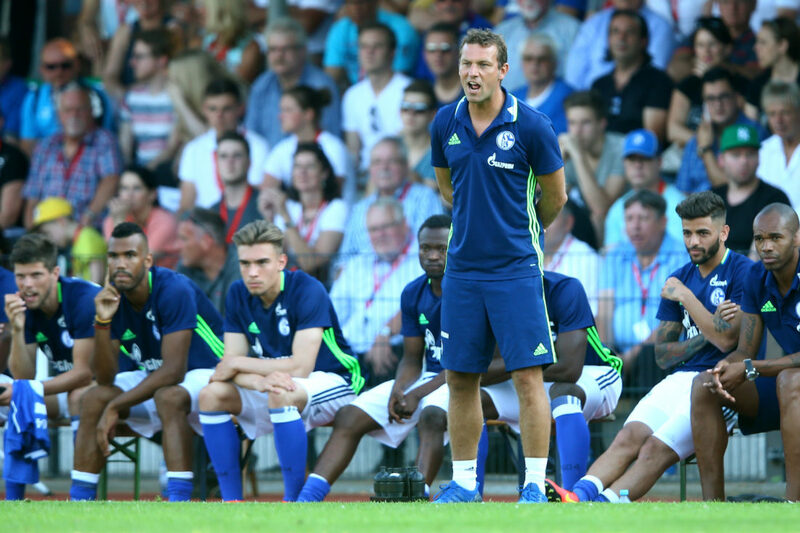 Insert Weinzierl, and Schalke hope to address many of what has been mentioned above. Just like at his time with Augsburg, especially relevant from two seasons prior, I expect Weinzierl to put a stronger emphasis on having an organized and well-drilled defense. Despite having a talent pool inferior to that of his new employers, Augsburg’s defense in the last two seasons have only allowed six more goals than Schalke – one has to assume that, with better quality to work with, Schalke’s defensive record can and will improve under the new man. Much of the hopeful improvement at the back will come by way of Weinzierl’s insistence of playing with two deeper midfielders to help shield the back-four. His deployment of Dominik Kohr and Daniel Baier deeper in the center of the park is something we can expect to see from the talented central pairing of Johannes Geis and Leon Goretzka – two young players who are more than capable of sitting deeper while also contributing further up the pitch (something we will come back to in a bit). Another major weakness of Schalke’s that Weinzierl will be sure to address is the amount of chances they allowed to be created from wide areas. With Sead Kolasinac and Junior Caicara all but assured of their places at full back, a greater defensive responsibility is likely to be instilled in them. Both enjoy getting forward, but a better balance of when to push and when to sit needs to be established, and if that can be remedied, Schalke will immediately find themselves in a better place defensively. 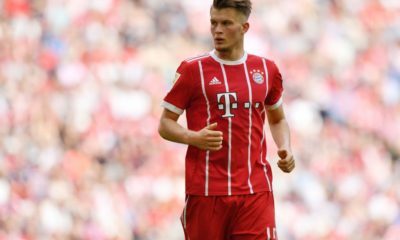 In regards to the attack, Weinzierl will be chomping at the bit at the chance to work with the likes of Klaas-Jan Huntelaar, Swiss wunderkind and summer acquisition Breel Embolo, Max Meyer, Alessandro Schopf and Eric Maxim Choupo-Moting – a veritable treasure trove of attacking talent compared to his options at Augsburg. Considering that Weinzierl has never attempted to deploy in such a manner that relies on possession, Schalke’s willingness to use their pace, technical ability and players who prefer to be direct will not change a great deal if at all. At Augsburg, he put an emphasis on his wide players bombing down the flanks, so the contributions of the likes of Choupo-Moting will be as important as last campaign or even more so. Because of a system relying on the counter is on the cards, it would be the perfect chance to use Embolo through the middle or down the right flank to utilize his pace and physical presence, but even if the veteran in Huntelaar must be called upon to lead the line, it would be the big Dutchman’s hold up play and adeptness at laying the ball off for others that could be another quality option depending on the opposition. Meyer and Schopf are sure to be the master puppeteers, but much like at Augsburg with Kohr and Baier, Geis and Goretzka will be encouraged to bypass the number ten and play direct long balls to the wider options or play a ball over the top for the center forwards. Defensive solidarity and quick, incisive and direct football is what can be expected from Schalke next season, with an emphasis on proper positioning and intelligent decision making. 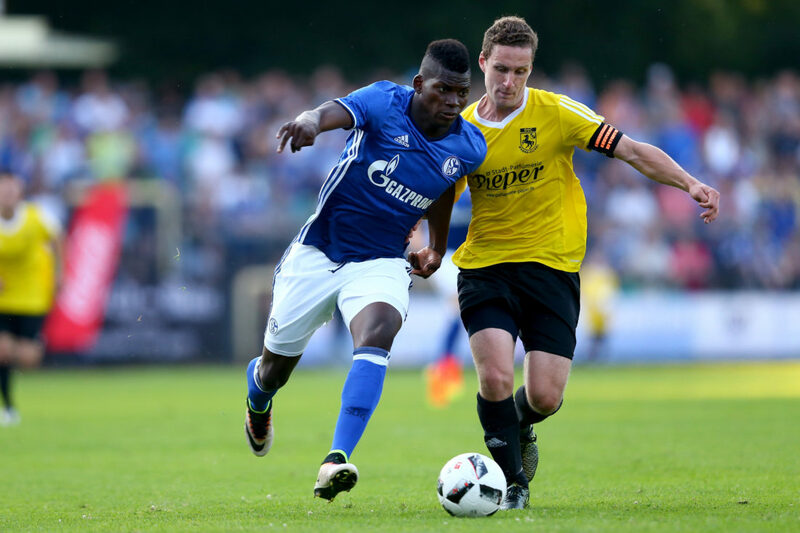 Schalke’s main summer business came by way of a 27.5m Euro move for the highly-touted Swiss teen Breel Embolo, and whether he will be started ahead of Klaas-Jan Huntelaar through the middle or on the right side, it’s a brilliant piece of business for the long term. The club also welcomed Spanish right-back Coke from Europa League masters Sevilla for 4m Euro, as well as bringing in former Weinzierl pupil Abdul Rahman Baba from Chelsea, after the Ghanaian international left-back was largely frozen out at Chelsea under Jose Mourinho and with an unsure future under new boss Antonio Conte. An additional move for veteran Brazilian center-back Naldo (free transfer from Wolfsburg) sums up the money spent. However, Schalke have brought quite a few youngsters through in the form of Bernard Tekpetey, Fabian Reese, Christian Rubio Sivodedov and Joshua Bitter, all coming from Schalke II or the U-19 side. Additionally, the return from loan spells of Timon Wellenreuther, Donis Avdijaj and Kaan Ayhan highlight the potential for Schalke to really tap into their youth pipeline in the coming seasons, even if many of those players see little to no time now, or are yet again loaned out. On the way out, as expected, is Leroy Sane – the highly sought-after German international completed a move to Pep Guardiola’s Manchester City for 50m Euro, which netted the club a total transfer profit of 23.5m Euro. Despite the added losses of Christian Clemens (Mainz), Marco Hoger (Koln), Robert Leipertz (Ingolstadt), Marvin Friedrich (Augsburg), Roman Neustadter (Fenerbache), Joel Matip (Liverpool) and the returning to parent clubs of Younes Belhanda (Dynamo Kyiv) and Pierre-Emile Hojbjerg (Bayern Munich to Southampton), Schalke should still be in very good shape for the season in regards to playing personnel. 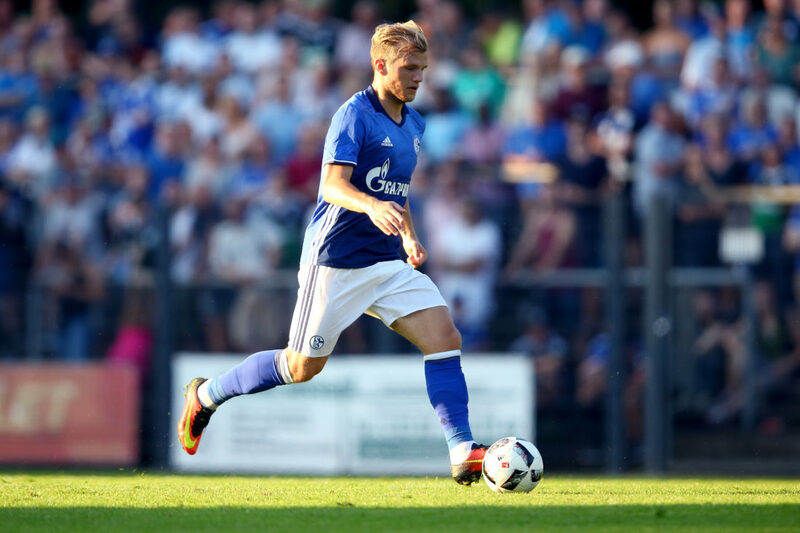 Johannes Geis – The importance of the central midfielders in a Weinzierl system means that deep midfielder Johannes Geis should be expected to build upon what was a very successful first season at the Veltins. His ability on set-pieces and eye for a pass from deep fits perfectly into the tactical schematic likely to be drawn up and applied once the Hinrunde begins. His five assists last season ranked second on the team behind Sane and Meyer (both with six), and it would not be a surprise if he was to improve on that total by the end of the coming campaign. Breel Embolo – It may only be his first season at this level, but despite his still tender age, the native of Yaounde could be primed for a big breakout campaign. With Huntelaar and Franco Di Santo the other options through the middle, it would make sense to give Embolo time on the right (he featured there plenty for FC Basel), considering the other options down the right at Weinzierl’s disposal are Sidney Sam and youngster Tekpetey. Confident, direct, quick on and off the ball and a potential goal threat from wider areas, he fits perfectly into the Weinzierl attacking mold. 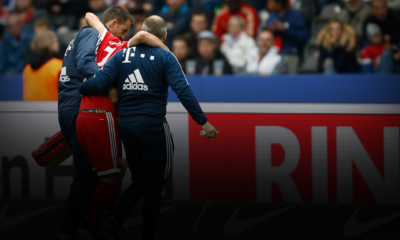 Leon Goretzka – It was difficult to leave out a few other names here, but the importance of the midfield pairing under Weinzierl cannot be overlooked. With Johannes Geis being able to pull the strings from deeper areas, the defensive contributions and fantastic engine of Goretzka are the perfect compliment. Strong in the tackle and adept at reading the opposition supply lines, he will be absolutely vital in helping Schalke spring on the counter once possession is regained in midfield – a bonus comes way of a few assists and even a goal or two he is sure to chip in with. 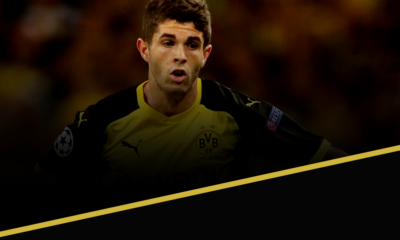 Max Meyer – Because I shouldn’t bang on and on about Embolo, I chose to highlight Max Meyer. 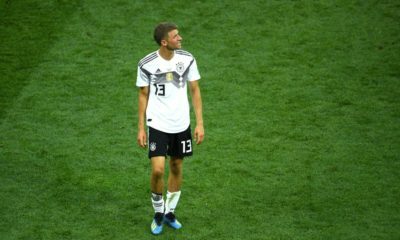 Seen as one of the most highly-touted young players in Germany, Meyer’s contributions last season to the tune of five goals and six assists was a very solid return that should improve as he progresses. Excellent on the ball, an eye for a pass, and being able to switch between pulling strings and being direct, his team-leading assist total and knack for popping up on the score sheet will be leaned on this season as it was the last. Though his defensive attributes are lacking, he’s still guaranteed his regular place in the XI. Though their fifth-place finish last term and inclusion in the coming season’s Europa League will be seen as a success on paper, Schalke are still very much a work in progress, especially in the areas highlighted throughout this piece. Markus Weinzierl, for me, is certainly a manager who can right the ship in those target areas while keeping the club’s footballing identity and tactical approach on track – continuity is key when a new manager steps in. In regards to expectations, the Bundesliga should be as tight as ever in the European places, but Schalke surely are capable of once again coming close to or achieving a Champions League place. The bare minimum should be qualifying yet again for the Europa League, and despite it being Weinzierl’s first season in charge in Gelsenkirchen, the supporters will be holding out hope for a top four finish come May.